New Designs in the Alchemy Stones Shops! Since we returned from vacation at the end of June, I have been hard at work to create new designs and restock our two Alchemy Stone shops. As we have a couple of Arts and Crafts fairs in our near future, we will be continuing to add many new designs in the coming weeks! Announcements of the where-and-when of the shows will be posted as soon as we receive confirmation-- check back often! Are they really all FREE Hand Painted? It is always interesting for me to watch people look at Alchemy Stones in a "live" setting, like an arts & crafts show or festival. People ask me "what kind of stencils" I use, and whether the designs are "a transfer." Some want to know if it "hurts my eyes" to paint in such detail. Others want to know if I sketch out the patterns before painting them on the rocks. No, I don't use any stencils, transfers or other "plans" created ahead of time. Alchemy Stones are 100% free-hand painted, going only by what I see inside my head. Even this large stone pictured here simply started as the single dot in the center, and then developed from there. I simply start with a stone and some colors... and then start building a design from there. After the first few elements are laid down on the stone, I pretty much just "intuit" what to do next. My wife insists it's "channeled information." Maybe she's right-- or maybe I just happen to be "one of those people" who work well on a really small scale. The metaphysical properties associated with a design definitely feels like channeled information, so maybe it all just walks hand in hand. Much of the time, I have no idea what's going to come out, when I start painting. And sometimes, I'm as surprised as some of those around me who have been watching. 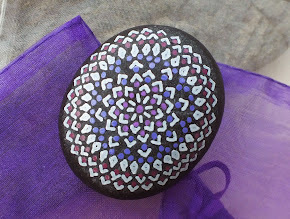 Alchemy Stones are definitely "inspired by" Sacred Geometry and recursive patterns in nature (fractals), but I generally don't refer to them directly as BEING Sacred Geometry because I don't want to lock myself into having to recreate accurate reproductions of the Flower of Life (for example) on every stone I paint... I'm more in favor of the "let's just see what comes out" method. Besides, it's a lot more fun that way! So to conclude, YES the stones are 100% free-hand painted, and every one is unique.